So watcha asking for this Christmas? will make this happen! (Isaiah 9:6-7 NLT). Christmas and tragedy are poor bedfellows. In this season of Advent as we remember the coming of Christ, we long for surrounding events to reflect the joyous mood. Then another unthinkable act of inhumanity happens and we shudder to remember that all is not well in this world. Evil men behead people to prove their bravado and intimidate those who don't embrace their radical hate. Victims' families suffer almost unbearable pain as they mourn the loss of their husbands, sons, and fathers. People who expected to live into old age die at the hands of propagandist. Children's souls lifted from this earth and passed into the hands of God because evil stomped through their villages. Without a doubt, we know the evil one instigated that brutal behavior. We long for God to step in and prevent atrocities. God alone understands all the intricacies of these losses and this march of evil as it impacts people both near and far from us. Opinions about how to prevent evil are as numerous as grains of sand. Yet things that really work seem beyond us. We strive for solutions. We look for reasonable answers. We want to fix things. We want to draw boundaries around evil — pen it up and never let it loose. We long to be in control of our lives and to make sure that our loved ones stay safe. We want good to penetrate hearts as we long to expel evil out of every corner of our world. That day is coming, however it's not here... yet. So we struggle, yearn, and look for answers for today. Where are we capable of banning evil? Where do we have dominion over powers of darkness? We have power over our own heart and soul. We cannot force other humans to turn to God and seek his will — to welcome a holy invasion of God and his life into their hearts. We only have the power to invite God to saturate us with his goodness and to ask that He lead us not into temptation but to deliver us from evil. Love God with all we are and have and do and think. Love our enemies and pray for those who mistreat us. Only God can gift us with what we really need. These expressions of love display the heart of our Father. When people are without God or a proper understanding of God as our Father and the Creator of life and love, they lose their way and their respect for life. When misdirected and power-hungry evil men seek to control lands and people through invasion and bloodshed, evil gains momentum and claims the lives of innocent people. When selfish parents prefer mind-altering drugs or a buzz from alcohol to parenting children — evil laughs at their folly and tallies its rewards. When we cheat in tiny or large ways, have lustful thoughts, deny justice, abuse power, and slay unborn children, then evil wins victories and life is cheapened. When polls show that seventy-five per cent of married people cheat on their spouses, the evil one sneers at God's call for fidelity in marriage. Christmas nears. We want to gather with family, hug our children. We want to hear bells ringing and choirs singing. We want merriness and happy reunions. We want dark clouds and deep valleys to go away. We want shadows of death to disappear. We long for streams of living water to purify peoples and societies. Wholesome streams of water always have a fountainhead, a beginning place. Christians know that fountainhead as Jesus Christ. He spoke to his followers and said, "The thief comes only to steal and kill and destroy; I came that they may have life, and have it abundantly" (John 10:10). Every moment we make choices to either drink from God's living water or take up with the thief whose purpose is to steal, kill, and destroy. Within God's fountain, he purposes to give love, restore life, and make whole. Someday, all tears will cease. God will triumph over evil, sickness (mind and body), and death. In the end, God wins. Even now, a victory occurs each time we make a conscious decision to obey the Good Shepherd, who can lead us into paths of right thinking and living. Only God can gift us with what we really need. This Christmas, may you receive the triumphant blessing of love and forgiveness that came to us through the avenues of Bethlehem and crucifixion. Evil nipped at the heels of Jesus, but he outran and won for all — his name is Immanuel, God with Us, the Prince of Peace. 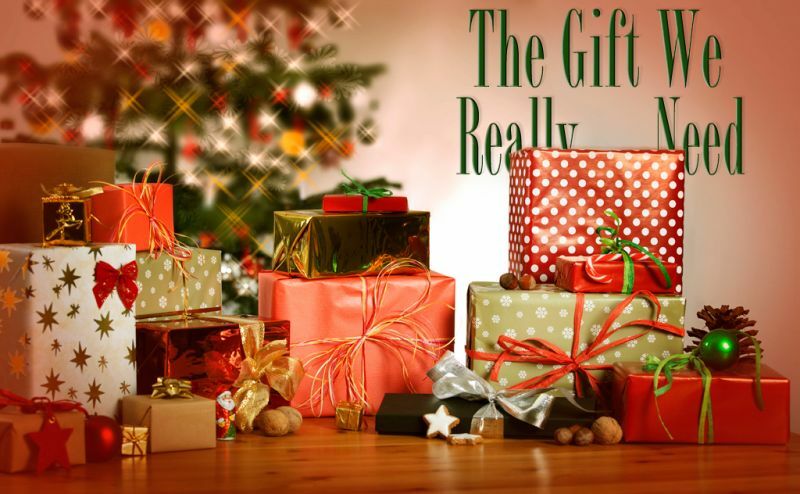 "The Gift We Really Need" by Cathy Messecar is licensed under a Creative Commons License. Heartlight encourages you to share this material with others in church bulletins, personal emails, and other non-commercial uses. Please see our Usage Guidelines for more information.